MAESTRO FREDERICK BINKHOLDER is artistic director of the Capitol Hill Chorale, a position he has held since 2000. A St. Louis native, Maestro Binkholder came to Washington from Atlanta, where he was on the choral faculty of Georgia State University. He also served on the choral faculties of Washington University, the St. Louis Conservatory and School for the Arts, Georgia State University, and Mercer University. 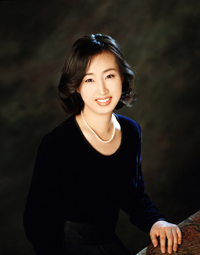 Organist Jinsun Cho holds the Bachelor of Music Degree from Yonsei University in Seoul, Korea. During her undergraduate studies, she traveled and studied extensively in Switzerland, Italy, Germany, and Netherlands. After receiving the Master of Music degree and Graduate Performance Diploma from the Peabody Conservatory of The Johns Hopkins University in Baltimore, she completed the Doctor of Musical Arts degree in Organ Performance from the Catholic University of America in Washington, DC. She won the first prize in the Arthur Poister Organ Competition, the second prize in the San Marino Organ Competition in 2000, and has won several prizes in other organ competitions. Dr. Cho was the Minister of Music at Christ Lutheran Church in Bethesda, MD, and a faculty of the organ department at the Catholic University of America. She also was a faculty member of the church music department at Mokwon University, Yonsei University, and Seoul Jangsin University in Seoul, Korea. Currently, she is the accompanist and assistant director of the Capitol Hill Chorale, and the organist at St. Alban’s Episcopal Church in Annandale, VA. The Capitol Hill Chorale is governed and administered by a board of representatives elected from within the Chorale, as well as appointed community members. The current board includes: One representative from each section, four at-large members, three community members, and emeritus board members. Virginia C. Gano is the honorary Chorale administrator, organizer, and Den Mother.